URL stands for Uniform Resource Locator. It is the address of a resource, which can be a specific webpage or a file, on the internet. It is also known as web address when it is used with http. It was created in 1994 by Tim Berners-Lee. URL is a specific character string that is used to access data from the World Wide Web. It is a type of URI (Uniform Resource Identifier). The scheme name or protocol. A host, normally called a domain name but sometimes as a literal IP address. A colon followed by a port number. Full path of the resource. 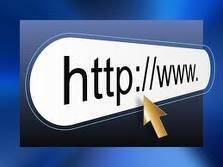 A URL can be entered manually by typing it in the address bar of your web browser. If the URL does not contain a valid server, a browser may display a "Server not found" error and if the path in the URL is incorrect, the browser may display a "404 error". A URL does not contain spaces and uses forward slashes to represent different directories. So, dashes and underscores are used separate the words of a web address. URI stands for Uniform Resource Identifier. It is a generic term for all the name and addresses which show objects on the World Wide Web. It is generally a sequence of characters which identifies a logical resource or the name and location of a file or resource in a uniform format. A URI can be of two types: Uniform Resource Locator (URL) and Uniform Resource Names (URNs). It enables resources to be accessed by other computers across a network or over the World Wide Web.